Kevin Harvick started sixth and finished 13th. The No. 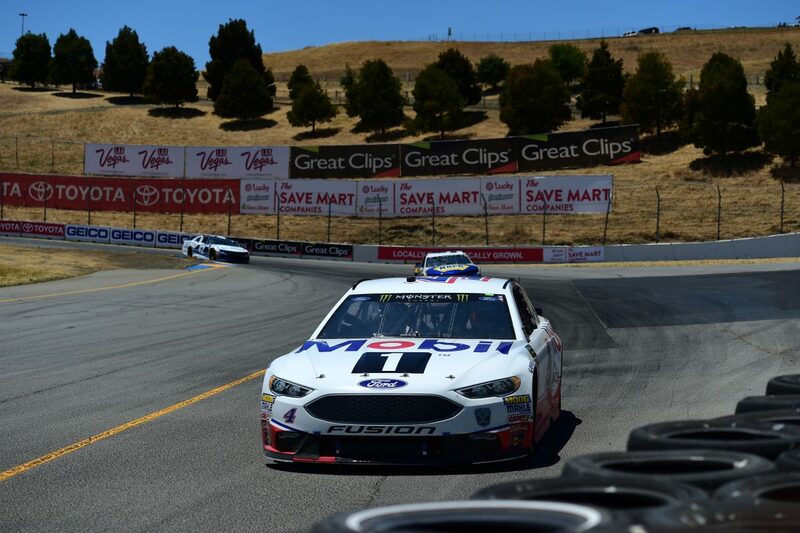 4 Mobil 1 Ford Fusion raced up to the second position by lap 14. Crew chief Rodney Childers called the Mobil 1 Ford to pit road under green-flag conditions on lap 23 for four tires and fuel. The green-flag pit stop proved to be a strategy move to better position the No. 4 team for the start of the second stage. Started second and finished 16th. Harvick stayed out under caution on lap 34 in the second position. The No. 4 Mobil 1 Ford raced to the lead on lap 42. Harvick surrendered the lead on lap 47 to pit under green-flag conditions for four tires and fuel and came out in the 16thposition. After teams came to pit road at the end of the stage, Harvick and the No. 4 team claimed the lead. Started first and finished second. Harvick surrendered the lead on lap 73 when he came to pit road for four tires and fuel and dropped to 14th. The No. 4 team reclaimed the lead on lap 83 and held it until lap 91 when he was passed by Martin Truex Jr. The following lap, Harvick came to pit road from the second position for four fresh tires and fuel. The No. 4 team rejoined the field in the fifth position and raced up to second by the checkered flag. This was Harvick’s 12th top-five and 13th top-10 finish of 2018. Harvick earned his sixth top-five and ninth top-10 in 18 career Monster Energy NASCAR Cup Series starts at Sonoma. Harvick led three times for 35 laps to increase his laps-led total at Sonoma to 95. Truex won the Save Mart 350k to score his 18th career Monster Energy NASCAR Cup Series victory, his third of the season and his second at Sonoma. His margin of victory over second-place Harvick was 10.513 seconds. This is the second time Stewart-Haas Racing (SHR) has placed all four of its drivers in the top-10 in a single race, with Harvick finishing second, Clint Bowyer in third, Kurt Busch fifth and Aric Almirola eighth. The last time was March 11 at ISM Raceway near Phoenix. This is the best collectivefinish for SHR since its inception in 2009. Rodney Childers said on the pit box that the 78 team snookered everyone with their strategy. What was your thought when you heard that?